This edition of the Foreign Policy Centre’s Iran Human Rights Review (IHRR) which focuses on justice brings together contributions on many aspects of legal and social justice in Iran and looks at topics often ignored in mainstream human rights and academic debates. 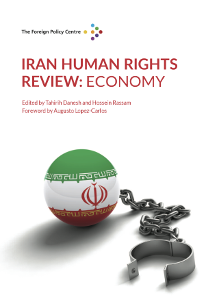 Co-edited by Tahirih Danesh and Hadi Enayat, this issue highlights that lack of justice in the Iranian administration not only affects human rights activists and opposition figures, but in fact ordinary Iranians whose plight is marginal to mainstream human rights and academic debates. This edition addresses the critical issue of violence in Iran and how it is used at all levels of society, from the actions of national government to domestic life, to reinforce the values of the Islamic Republic and prevent challenges to the status quo. The Iran Human Rights Review: Violence tackles a number of important issues including the role of the Islamic Revolutionary Guards Corps (IRGC) and the Baseej, the use of the death penalty in spreading fear, the treatment of prisoners and systemic discrimination against women, ethnic and religious minorities in Iran. The aim of this first edition of the Iran Human Rights Review is to develop public understanding of the fundamental challenge to human rights in general, and the right to religion or belief in particular, posed by the Iranian regime. It seeks to put forward a vision of a future in which Iranians are free to follow the call of their consciences to worship as they wish to do so or not to at all, while laying out some of the steps needed to realise such a vision.